In 1889 the Second International was founded as a result of the attempts of the socialist parties of Western European countries such as Germany, France and Belgium to bring together different social democratic parties of the time. For the most part, the world communist movement of the future would emerge from this organization. While the Second International remained focused on Western Europe from its foundation to its collapse, and while it was designed from the start as a federation of national parties rather than a centralized structure, it was nevertheless to become a magnet for all the socialist movements of the time, from North and South America to the Far East. Even before the formation of the Second International socialist organizations had been formed in several countries outside Western Europe. Nevertheless, social democratic parties were to become widespread only after its formation. In 1891, the Bulgarian Social Democratic Party was founded under the leadership of Dimitar Blagoev, which was to be renamed the Bulgarian Social Democratic Workers’ Party following its merger in 1894 with the Union of Bulgarian Social Democrats formed by Yanko Sakazov. In 1892 the Polish Socialist Party was formed and a year later the faction led by Rosa Luxemburg and Leo Jogiches, the Polish Workers' Union, left to form its own party. In 1896, the first socialist party of South America, the Socialist Party of Argentina, was formed. In 1898 the Russian Social Democratic Labor Party emerged from the seeds of the Emancipation of Labor group formed by Marxists such as George Plekhanov, Vera Zasulich and Pavel Axelrod fifteen years previously. In 1901 the Japanese Social Democratic Party was founded by Sen Katayama and in 1903 the Serbian Social Democratic Party was formed on the basis of the Erfurt program of the German Social Democratic Party. 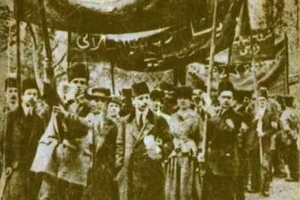 In 1904, the Russian Social Democratic Labor Party took the initiative to form the Muslim Social Democratic Hummet Party in Azerbaijan with the aim of appealing to the Central Asian workers. This was followed by the Social Democratic Party of Iran, founded in 1905, and in 1909, the Greek Socialist Party was formed by Platon Drakoulis. Like their sister parties in Western Europe an overwhelming majority of the socialist tendencies organizing into parties outside Western Europe had their roots in the workers’ movement and gained strength on the basis of the workers’ movement. Although not to the same extent as in Western Europe, the conditions of capitalism in the period between 1890 and 1910 gave some of these parties the opportunity to become mass organizations. Consequently, the same opportunist, reformist and revisionist tendencies that affected the Western European parties also started to appear in the parties outside Western Europe. This in turn resulted in the formation of left wings in opposition to these tendencies in these parties also. Similarly, despite all of the elements claiming to defend the slogan of internationalism, there was no definitive test of which were true to the principles of internationalism and which weren't,. The workers’ and socialist movements to appear in the Ottoman Empire developed in the framework of this general situation. Unsurprisingly yet again, this increasing social dominance of the non-Muslim bourgeoisie had its reflections in the ideological field as well, through the creation of schools to teach positive sciences even in the most remote villages, and spreading new bourgeois ideas such as liberalism and nationalism. Thus, for the first time in Ottoman history, as industrialization and capitalist relations began in the cities, bourgeois ideology was also being spread in the countryside. With the intensification of migration from the countryside, a working class was formed from the work force in the factories. However, the top level of the Ottoman state was not happy with these developments, which it saw as completely against its order and world-view, and its solution was to adopt extremely repressive measures. This resulted in the developing bourgeoisie sharpening the nationalist aspects of its ideology and led to the first national liberation struggles in the Ottoman Empire. Certain groups of the Ottoman non-Muslim bourgeoisie, like the Greeks, managed to lead successful national liberation struggles and form their own nation states. Other groups, however, the Armenians in particular, failed to create nation states because, unlike the Greeks, there was no special area where they were concentrated in the population. Due to this, the importance of non-Muslims in the industrial bourgeoisie of the Ottoman Empire continued and the politics of this rising force started to influence Ottoman politics. Both the non-Muslim bourgeoisie and the Western capitalism that supported it demanded certain reforms of repression in the Empire2. Unavoidably the appearance of capitalist relations quickly resulted in class struggles by thousands of recently proletarianized people. From the 1800s there were protests in the factories. There were also demonstrations in several parts of the Empire against high taxes. Initially the most common action of the workers’ movement in the Ottoman Empire was sabotage of machinery, etc. Towards the end of the century these were abandoned in favor of strikes as more effective actions, but until these became more common, acts of sabotage continued. The government’s response was repression. The first recorded strike in the Ottoman Empire was in 1863, in the Eregli coal mines, but according to records strikes became widespread from the beginning of the 1870s. Industry was developing rapidly during this period and many experts and workers were sent out from countries like England, France and Italy. In February 1872, following a one day strike of English shipbuilding workers in Constantinople, telegraph workers in Pera went on strike. In April, workers on the Haydarpasha-Izmit railroad went on strike. All the workers struggled together, especially in the railway strike. In this way native workers with little or no experience of struggle were able to tie up with European workers, to discuss with them and gain first hand knowledge of the experiences of the European working class. These experiences spread from neighborhood to neighborhood, from coffee house to coffee house in working class areas. In January 1873, hundreds of native Christian and Muslim shipyard workers from Kasimpasha went on a week-long strike together. In 1875, native and foreign workers, this time numbering over a thousand, again went on a strike against horrific conditions of exploitation.5 1876 turned out to be a year in which very important workers’ actions took place at the heart of the Ottoman Empire. In Constantinople, workers in fez factories, arsenals, printworks and shipyards as well as tram and railroad workers of different ethnic backgrounds organized strikes and demonstrations. In Kocaeli, there was a railroad workers’ strike. In Izmir, striking sewing workers formed a workers’ committee - another first in Ottoman history. Thousands of workers participated in the strike wave of 18766. Strikes continued, albeit in decreasing numbers, until 1895. Sultan Abdulhamid II belatedly realized the threat posed by workers’ actions and his regime of repression was intensified after 1878, severely hitting workers’ struggles. While heavy repression could not stop strikes for good, for a while it did manage to make such action a rare event. But in 1902 the working class resumed its struggles in a more massive and militant way,7 and it was these experiences that led to the formation of the first socialist tendencies and militant workers’ organizations of the Ottoman Empire.